Cards by Jessi: God Jul, igen! Jag deltar i: C.R.A.F.T. (Sketch), ABC Christmas (Q is for Quick and Easy), Penny's (Christmas, Children or Critters), Avenue 613 (AG), Suzy Bee (AG), CHNC (Merry and bright -the stars in this case) och Sparkles Christmas (Snowflakes). Adorable card!!!! I love the little fun green trees down the side. Thank you for participating in Suzy Bee's Bloomin' Challenge this week and good luck!!! 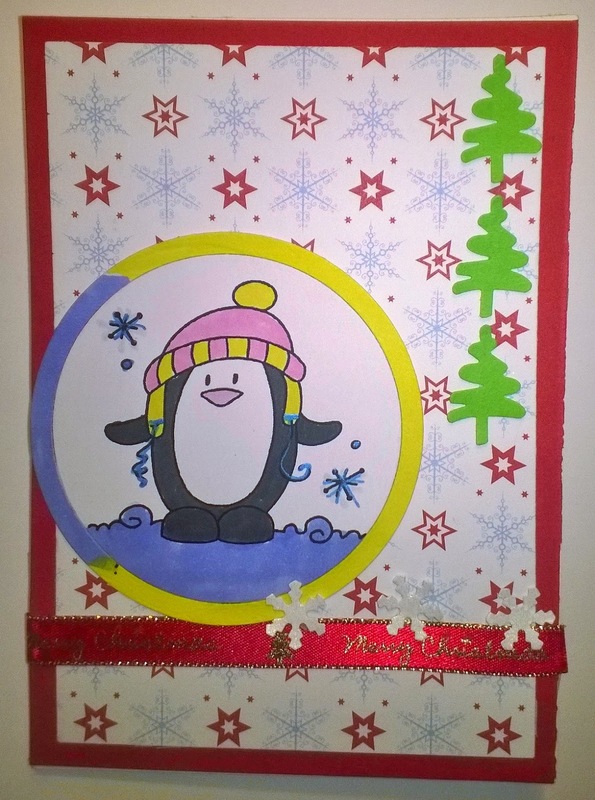 Really cute card - love that penguin! Very nicely done! Thanks for dropping this off by our house here at 613 Avenue Create! Super sødt julekort du deler med os, tak for du deltager hos ABC Christmas Challenge.